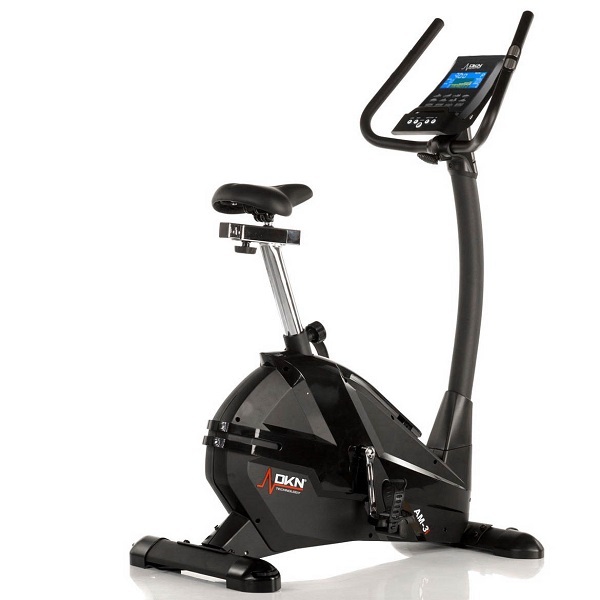 DKN EMB-600 Exercise Bike Review & Best UK Offers! First things first. Before you can ride it, you need to build it, and to build it you need to get it out of the box. Obvious yes, but this is where the first thing you’ll notice if you buy one of these is that it’s a substantial thing. For an exercise bike the box is much bigger than expected. At nearly 73kg it’s not light either, so even before the box was open it was obvious that the EMB-600 is a serious piece of kit. While the price is a guide to that, we’ve seen more expensive bikes that are substantially smaller and more lightweight so upon arrival the box made a statement all of it own. Out of the box, another nice surprise – the bike is partially assembled. This does make things that much easier as it reduces the number of steps, but also the number of items in the hardware pack are minimal making it easy to identify what part goes where. Total assembly time (not counting unpacking the bike) was 25 minutes which is something that most people shouldn’t find too taxing. No issues here. All the parts went together without a hitch and everything that should have been there was there which considering this is a DKN product isn’t a surprise, but it’s still very welcome. Once built this bike looks striking. The carbon colour grey bodywork with bits of black and silver metalwork and flowing lines makes it look uber-modern. We were all seriously impressed. 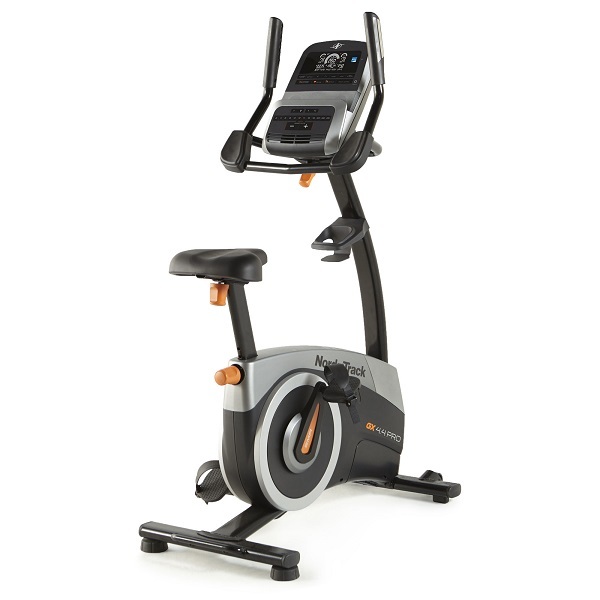 On looks alone, this is most definitely a gym style bike that looks far closer to a commercial product than home bike. It looks great and at this point, already really quite impressed, the team was simply itching to get on and take it for a test ride. Before that though, the final stage of setup was to make sure the bike was completely level which was made particularly easy because the EMB-600 employs adjustable leg levellers on all four corners rather than the usual two at the rear providing excellent stability. Getting the right riding position is quick and simple via the quick release mechanisms for the saddle height and distance from the bars. The saddle is nice and wide and gel padded providing plenty of comfort (even for more generously proportioned team members, no names!) although it does use a standard fitting so if one wanted to put a different saddle on, a quick visit to your local bike shop or online, will provide plenty of options. Though there shouldn’t be a need for that here, as the everyone in the office found the EMB-600 comfortable, and they can be a right picky bunch! The console design is noticeably DKN, but it’s been trimmed down in complexity so there are just 7 buttons and they’re laid out clearly and logically. The screen characters are large and clear and it’s easy to see DKN’s know-how at work with all the training data including pulse, time, distance, speed, calories et al all very easy to see. Without even looking at the instructions, the average user isn’t going to take long to figure out how things work and DKN have stuck by their tried and tested methods of control so getting started is a cinch. There’s also a tablet holder ledge positioned in the middle so putting your tablet or smartphone front and centre while you workout is an option if you want to watch TV or listen to music. There are 16 workout options including manual, user-defined, 12 pre-set workouts (4 beginner, 4 advanced, 4 performance), heart rate control and a constant Watt programme. In addition to these workouts there’s also a Bluetooth connection so you can download compatible apps (our favourite being Kinomap!) to take advantage of all the additional training options that they bring. It’s nice to see that DKN have opened up their hardware to get it to work with 3rd party software apps and DKN tell us that the number of compatible apps will be increasing over the coming months. The more the merrier was our reply! Moving onto the mechanics – the EMB-600 feels really, really good. Within a few turns of the pedal you can tell this not your run of the mill home exercise bike. This is no doubt the result of what is clearly precision engineering and it’s clear that DKN haven’t spared any expense here. The bearings throughout appear to be of an extremely high quality and when combined with the 16kg (35.2lbs) flywheel – yes, that’s not a typo, they really have used a 16kg flywheel here – the result is a super-smooth, super quiet ride that feels damned good. It doesn’t end there either. 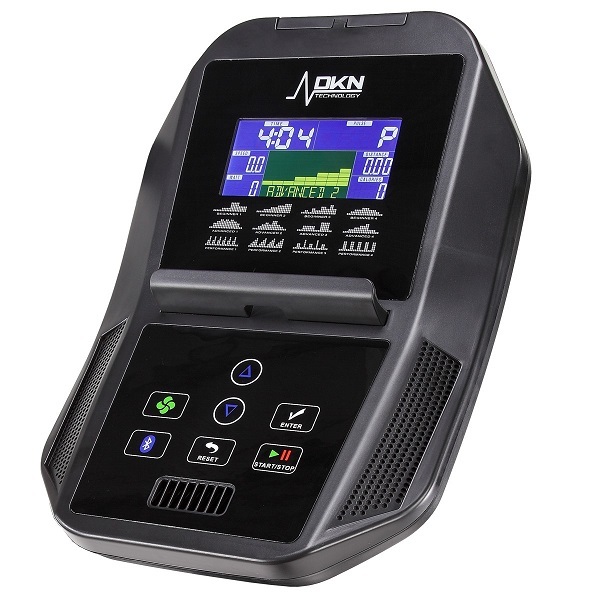 Most manufacturers would be content to produce a bike anything like as good as this, but DKN being DKN, have taken things a step further (and higher for that matter), by installing an electromagnetic braking system instead of the industry standard servo magnetic braking system. 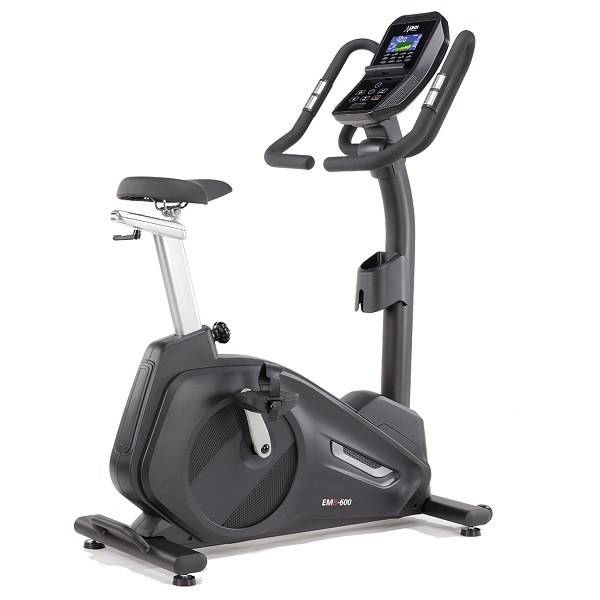 The result is transformative and propels the EMB-600 into the light-commercial class of exercise bike. 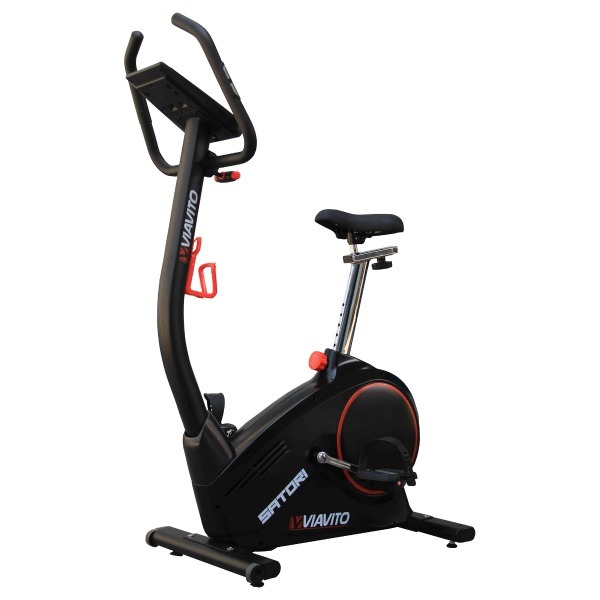 Without boring the reader, most home exercise bikes work by attaching a magnet to a servo motor which then moves the magnet closer and further away from the flywheel to generate and alter the resistance level. There are drawbacks to that system in that firstly there are moving parts, and moving parts can, and do, wear and sometimes fail. Secondly changing resistance levels is never that fast (can be a bit noisy too). 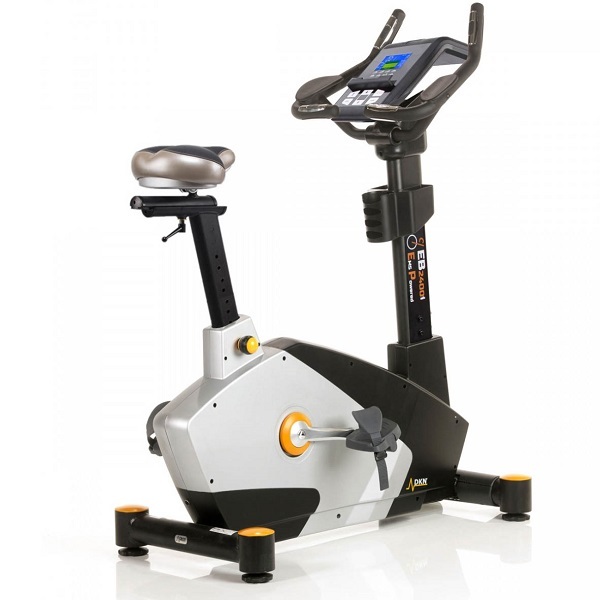 By installing an EMS braking system the potential point of failure of the servo motor is removed making it far more reliable and the bike comes to life when performing interval and high intensity burst training. The switch from minimum resistance up to maximum and back down again is lightning fast meaning the EMB-600 delivers awesome performance for this type of training. Again, this is usually found on commercial bikes and is very rare, though not unheard of, in home bikes. Our verdict? If this is a taste of things to come from DKN over the course of 2018 we’re in for a treat. The EMB-600 hands down beats anything at all that we’ve come across in this price bracket. No ifs, no buts. It’s also better than models which fall into higher price brackets, from industry leading brands recognised as being market leaders that we’ve tested too. This is squarely puts the EMB-600 one of the best home use bikes we’ve tested. We loved it and at this price, if you have the budget, this is a no-brainer. Superb effort and we wouldn’t be at all surprised if other manufacturers sit up, take note, and start to follow DKN’s example. Wow! 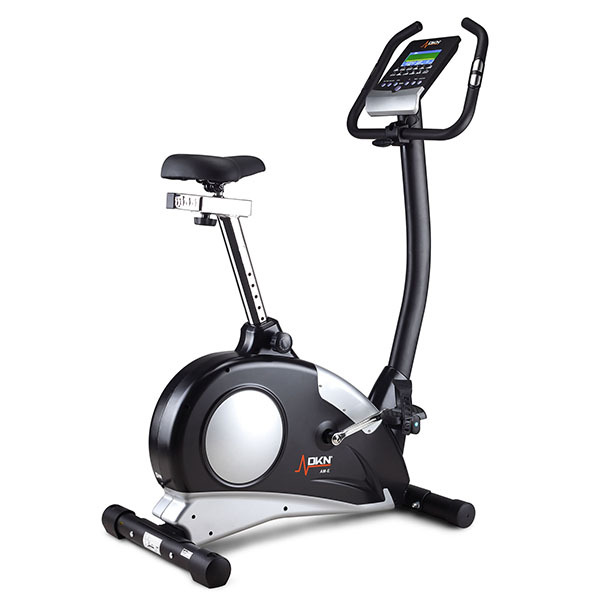 Really, it's not often we're this taken by an exercise bike but from the box arriving to getting on and riding it, the EMB-600 is impressive. It's ultra solid, super quiet, responsive, comfortable and a real pleasure to ride. Without doubt, given the price point, it's absolutely fair to say that DKN have come up with a market leading product here. If you have the budget and the space then we have no hesitation in recommending this bike. In our opinion it sets a new standard in what to expect for your money!